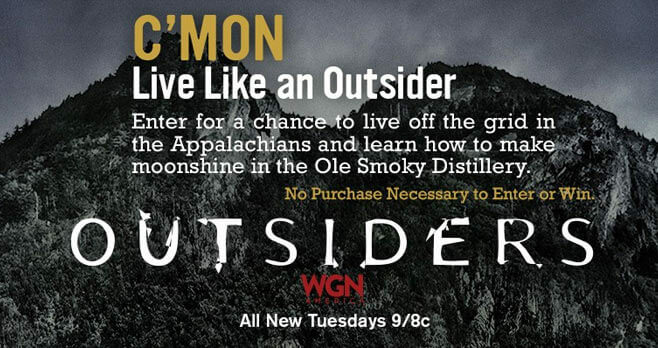 Ole Smoky teamed up with WGN America’s Outsiders to bring you the WGN America Outsiders Moonshine Sweepstakes, a great new promotion where you can enter for a chance to live off the grid in the Appalachians and learn how to make moonshine in the Ole Smoky Distillery. The grand prize consists of a 4 day/3 night trip for four to Ole Smoky Moonshine’s Distillery in Gatlinburg, Tennessee. The trip also include the opportunity to learn how to make moonshine whiskey at the Distillery plus, hunting and fishing excursions in Gatlinburg. Visit www.olesmoky.com or www.wgnamerica.com and click the Promotional Banner Ad to access the Sweepstakes entry form. Complete the official entry form with your name, address, date of birth, e-mail address and daytime phone number. Click the “Submit Entry” button to receive an entry in the Sweepstakes. 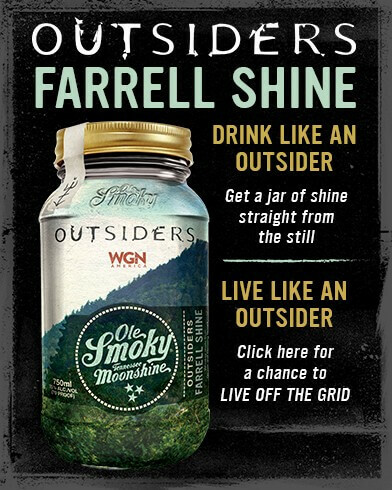 The WGN America Outsiders Moonshine Sweepstakes is open only to legal residents of the 48 contiguous United States who are 21 years of age or older. Void in Alaska, Hawaii, Puerto Rico and where prohibited by law. Begins on January 24, 2017 at 12:00 p.m. (noon) PT and ends on April 30, 2017 at 11:59 p.m. PT. Limited to a maximum of one entry per person per day throughout the Sweepstakes Period. The winner will be selected in a random drawing from among all eligible entries received. The drawing will be conducted by Administrator on or about May 4, 2017. For the name of prize winner, send a self-addressed stamped envelope to Blue Engine Marketing, 120 East 23rd Street, NY, NY 10010, Attn: Ole Smoky Outsider Sweepstakes for receipt by May 12, 2017. Winner’s list will be available after June 1, 2017. This Sweepstakes is sponsored by OLE SMOKY DISTILLERY, LLC, 236 E. Main St. #136 Sevierville,TN 37862. For complete details about this Outsiders Sweepstakes, see the Official Rules.